As part of the Brits Off Broadway Festival at 59E59 Theaters, a beautifully produced play shines a harsh light on how effortlessly modern politics can wreck the lives of those that it finds inconvenient. The great irony of international politics is how effortlessly it can destroy the people it is, in theory anyway, intended to protect. Lives are wrecked between all those press conferences and handshakes and in A British Subject, the multi-talented Nichola McAuliffe has written and acted in a gripping (and true) portrayal of one man's fight to stop the geopolitical gears from grinding yet another person into dust. The man at risk of being lost here is Mirza Tahir Hussain, a dual British and Pakistani citizen. In 1988, the then 18 year old Hussain was jailed for killing a cab driver in self-defense while visiting family in Pakistan. By the time any Western press outlets notice Hussain's plight, he has been on death row for 18 years. Don Mackay, a journalist for England's The Daily Mirror (and husband of McAuliffe), flies to Pakistan out of professional obligation but becomes obesessed with telling Hussain's story and winning his freedom. Maybe it's a given that Don Mackay would be painted as a sympathetic character, seeing as his wife wrote the play, but Tom Cotcher's portrayal still works perfectly to get the audience behind his quest to free Hussain from prison. He is easily identifiable for a Western audience as a stand in for the average apathetic observer: glib, sarcastic, and numb to the horror stories that flood the media. It is only when he meets Hussain face to face, in the play's riveting centerpiece, that Mackay's feelings shift. After he artfully gains access to interview Hussain--the first journalist to even attempt the feat in his 18 years on death row--Kulvinder Ghir, the actor who plays Hussain, gives a performance of languid motions and whispers that cut straight to Mackay's heart. What allows the play to be engrossing, funny, and heartbreaking all at once is the near-perfect production. Lighting and sound are crafted for maximum effect, but restrained enough to skitter on the edge of melodrama without surrendering to it. A striated square of harsh light with a background of faintly buzzing flies transports the audience seamlessly from, say, the stuffy British ministry offices to Hussain's Pakistani prison cell. In Hussain’s cell, the background sounds of traffic and honking that washed over the stage when Mackay was outside on the street fade, and the low buzzing of flies in the prison slowly gives way to a crushing silence. Hussain's words are so soft and slow, and the absence of any other sound so striking, that the audience becomes painfully aware of its own noise. Coughs and wheezes (it's winter in New York) become deafening as Hussain details the horrors of his life in prison. The effective restraint in tech and performance also extends to the dialogue: Hussain doesn't speak in easy prison cliches such as the stench, or beatings, or boredom. Instead, he explains how they can't even play chess anymore, because "with nothing else to do, people cannot bear to lose." The second half of the play, dominated by Mackay's passionate campaign to publicize Hussain's plight, struggles to match the first half's breathless pace and palpable tension. At times it does, like when Mackay's wife (a role which has McAuliffe playing herself) shouts at someone explaining that “at least” Hussain’s execution isn’t until New Year's Eve: "While you're singing Auld Lang Syne, he'll be evacuating his bowels at the end of a rope." That the play fails to wring any real drama out of the quest to free Hussain can be partially attributed to the facts of the story: the efforts took place mostly in Britain, mostly between people who weren’t in as desperate (or interesting) situations as Hussain himself. Transitions between scenes may still be seamless, but the locations to which they transport the audience are hardly worth visiting. Absent the tension of the first half, focus is drawn to the play's weaker themes, such as the relative merits of faith and reason, prayer and action as a means to spring Hussain. When these limp themes take center stage, it’s akin to the background sounds becoming the main dialogue, and it’s an odd position that the second half puts you in: wishing you were back in prison with Hussain. The recession has affected everyone differently, and each outcome gives way to a story to be shared. Almost ironically, the Flea Theater has seized this as an opportunity to commission six playwrights to write short plays about the recession so far. Running from surreal and silly to schlocky and safe, the evening is half successful, with only three playwrights taking a big enough risk. Ronald Washington and Amy Jackson in "Severed"
The Flea Theater has commissioned six playwrights to create individual shorts on their take on the economic crisis, entitled The Great Recession. The evening consists of lots of silence, a few laughs, but mostly awkward moments where the playwrights’ try too hard to be witty or relatable, only to make no connection with the audience at all. The exception lies when the playwright and director work together to create identify conflict and struggle in which to override any generic thematic structure. This only accounts for half of the production, however, and the back-and-forth of stark, memorable drama to predictable setups make the evening imbalanced. The anthology lacks coherence and tie-ins from piece to piece, losing something a little each time, and not quite ever gaining it back. Starting the lineup is “Classic Kitchen Timer” written and directed by Adam Rapp, in which a young woman, Sarah Ellen Stephens (Lucy Norwood,) leaves her hometown to take part in a “social experiment” which, if completed, results in a grand prize of $25,000. Sarah begins to reveal the underlying conditions as she gets interviewed by the evening’s Host (Nick Maccarone). Her subdued responses and ensuing serious, lingering beats imply her concerns about the arrangement go beyond monetary reward. Norwood portrays Sarah with steely eye contact and a trembling, fearful delivery that leaves chills and builds tension and Maccarone, an eerie clown in white powder, red lips, and suspenders, engages the audience with the same congenial-yet-creepy demeanor he later extends to Sarah, generating both anticipation and fear. Rapp’s thirst for drama shows in his writing, and the situation he constructs here does a great job of combining personal ethics with financial constraints. In the next play, “Fucked”, written by Itamar Moses and directed by Michelle Tattenbaum, a young couple, Cindy (Jessica Pohly) and Reed (Dorien Makhloghi,) squabble over a vacation funded by Reed’s father. This premise never gets off the ground, however: Pohly’s performance remains stuck in whiny melodramatic girlfriend gear and Makloghi, as Reed, remains apathetic and unresponsive, with halted, detached line delivery. “New York Living” by Thomas Bradshaw follows closely to Moses’ lead with even less success. Bradshaw’s characters lament about the recession in another modern New York setting, but again do not react as if truly affected. Jeff (Raúl Sigmund Julia,) an actor with a trust fund has had relationship trouble with his fiancée Jen (Morgan Reis,) and he redirects his emotions towards his costar Adrian (Anna Greenfield) in a play directed by David (Andy Gershenzon). This clunky and poorly-coordinated love rectangle never develops depth or dimension, relying instead on pulp dialogue and outlandish quick fixes to the problems at hand. Erin Courtney balances out such a shaky intro with her play “Severed”. Under Davis McCallum’s direction, young, optimistic job-seekers perform interview-style monologues in the hopes of scoring a new gig. McCallum’s sincerity for her subject shows through and through, and never crosses the line to become preachy or moralistic (the characters don’t mention the recession at all). In addition, “Severed” has an amusing subplot that allows actress Amy Jackson to shine as a hungover daycare supervisor on her morning commute. Out of the fifty-something actors in The Great Recession, Jackson by far proves the most delightful with her smiley, giddy, and goofy performance. She knows how to cast it out for big laughs, but also how to reel it in and replace it with just as entertaining sass and sarcasm. Also notable is Sheila Callaghan’s “Recess” in which eleven people share a one-room apartment refugee-style, relying on government authorization for everything from food rations to basic utilities, living without walls, telephones, internet or even proper clothing. Out of desperation and frustration these characters retreat and isolate themselves and then reach a point of hysteria before turning on each other. With its stark, terse writing and Kip Fagan’s brilliant staging and directing, Recess resonates with extreme drama and shock factor, surpassing all the other shorts. “Recess” proves a tough act to follow, and “Unum” by Will Eno with director Jim Simpson leaves the entire evening on a low note. Set in an obscure American town where mortgage interest rates soar and money keeps getting printed by mint factory workers, the drama Eno tries to set up never catches. Instead, each dialogue exchange sags by unmotivated, unconvincing actors, and the generic complaints of tough economic times pile on, from job losses to the rise in healthcare costs. This effect of echoed, regurgitated jargon about unemployment and poverty feels strained and rehashed, and doesn’t do much to entertain and enlighten. While it does have its moments, The Great Recession by the Flea Theater plays it too safe to really hit home and resonate with the audience. Performances (through 12/30): Mons.-Weds. @ 7pm, 10pm; Sats. @ 3pm, 7pm, 10pm; Suns. @ 3pm. ‘Tis the season for cheery performances but if you are looking for something different these holidays, She Like Girls is about as far from The Rockettes as you can get. Inspired by a true story, Chisa Hutchinson’s play about a teenage girl and her first… girlfriend is honest, emotional, and – quite simply – well written. The fact that the main character – Kia Clark – is killed at the end of the play is no secret. On the playbill is an abstract image of a young woman getting shot (plus all the publicity makes mention of the true story that inspired this production). The drama here is not from the element of surprise, but from the inevitable. She Like Girls is told from the perspective of a teenage girl who finds that she has fallen for a classmate. Whether watching scenes from her inner-city high school or getting glimpses of her hormonally driven dreams, we are made to sympathize with her struggle. Ironically, throughout the play it is Kia who seems to have it easy – we watch others deal with sickness, abuse, and even hate crimes – but in the end it will be Kia who will be hit the hardest. The performers all come across as age-appropriate, and admirably embody their roles. They’re not “polished” performers, but that roughness jibes with the production’s content and aesthetic—urban teenagers struggling with their sexual identities. Special mention must go to Karen Eilbacher as Kia, who has clearly brought her character’s inner struggle to the outside. What stays with the audience, however, is Hutchinson’s writing. She may still be growing as a playwright- similar to the actors—but her modest writing stirs up emotions and doesn’t patronize. What, I wonder, will transpire from her inspirations in the future. 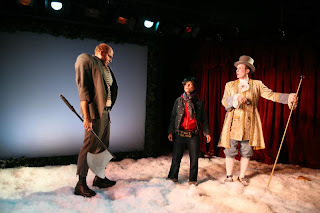 With Seven in One Blow, Axis Theater Company has rewritten a classic Brothers Grimm tale (of a boy who kills seven flies in one swat and goes on to perform fearless feats) for a modern, child-friendly audience. In doing so, however, they’ve traded satire and irony for a watered-down, happy-go-lucky version. In the Brothers Grimm version of “Seven in One Blow,” a young boy kills seven food-stealing flies in a single blow. He makes a belt to boast of this accomplishment and seeks his fortune with his newfound bravery and cunning, unaware that everyone he meets assumes he has killed seven men. In the Axis Theater Company’s annual production, they have traded in all the satire and irony for a sappy version marketed to young children right before Christmas. Randy Sharp’s new script and lively, cheerful direction, now features an androgynous female heroine, Kid (Lynn Mancinelli), who sports a cropped pixie haircut and a rough-and-tumble costume of work boots, navy khakis, and suspenders. After fashioning her belt, she leaves home— not to seek her fortune so much as to flee her workaholic, inattentive parents. What follows grows increasingly cheesy: the conversion of a materialistic king, QK (David Crabb), and his daughter, Princess Fartina the Beautiful (Britt Genelin), into thoughtful and considerate rulers; the calming of an angry Pea (Laurie Kilmartin) thanks to the children in the audience shouting out their love for the vegetable. The script’s attempt to engage a young audience with its goofy cast of characters and simplified storyline emphasized by small sentences (most of which start with gee and end in gosh) comes across as a cop out—worse, as something purely commercial. The most audience-grabbing part of the play has nothing to do with the story, but with what the actors do with their one-dimensional characters, and the masterful crew behind all the bells and whistles. In true children’s story fashion, the principal villains outshine the protagonist in personality and presence, and here the first to do so is Ogre (Jim Sterling). Stomping onstage with a bellow and a growl, Sterling terrifies and amuses at the same time, and like most ogres, makes up for his overwhelming brawn by being gleefully outsmarted. The Witch (Spencer Aste), serves the same purpose from an entirely different angle. Perfecting a falsetto screech and bob-and-weave leer all over the stage, Aste epitomizes a creepy old woman with his hunched-over demeanor and all-black ensemble. The Scarlet Pimpernell (producing director Brian Barnhart), though not a villain, is also a delight. Fretting and flitting about with a proper British accent, the Scarlet Pimpernell yearns for unconditional friendship despite his shaky personality, and Barnhart’s genuine, passionate performance warms up the entire production. The narrator (Marc Palmieri) also smooths out the play’s choppiness. His old-school Brooklyn accent gets so animated—as does Palmieri, always playing to the curious young audience—that plot holes are ignored in favor of audience participation. 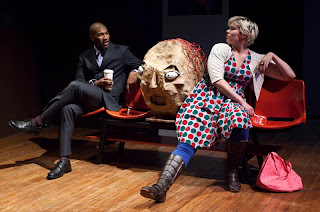 Costume designer Elisa Santiago provides most of the play’s childlike wonder, with archetypal choices that help the audience recognize a Witch or an Ogre while still giving these images a creative twist, such as linebacker shoulder pads, bald wigs, and bucktoothed gap teeth. This works especially well with the traditional fairytale garb of capes, sashes, vests and boots, creating comical, cartoonish costumes without going overboard. Lighting and sound designers David Zeffren and Steve Fontaine work together with marvelous results, such as the blazing red and white light show when Ogre tries to kill Kid or the goofy gunshots QK fires into the air. Seven in One Blow isn’t the most memorable bit of children’s theater, but it does serve the purpose of a perfect holiday treat: sugary and colorful enough to be enjoyed in the moment. Snow White is a dance-theater show, part of Company XIV’s Apple Trilogy. A baroque-infused mix of opera, dance, and theater, adults and children alike will be delighted with this interpretation of a classic fairytale. Director and choreographer Austin McCormack presents this stunning production, which showcases the talent of Company XIV’s repertory performers. We often forget the dark nature of many classic fairytales. The Big Bad Wolf wants to eat Little Red Riding Hood, and is later hacked to death by a hunter. Hansel and Gretel encounter a witch who wants to eat them, and they escape by trapping her in her own oven. In Snow White’s case, her wicked stepmother finds new ways to try and kill her, so that she can be the fairest woman in the land. Company XIV’s production of Snow White is no different: creator, director, and choreographer Austin McCormack has turned from the darkness to the visually stunning, using a delightful collection of dance, opera, puppetry. and theater to do so. The show is guided by Nick Fesette, who doubles as the show’s narrator and huntsman. Influenced by McCormack’s baroque dance training, Snow White showcases both classic ballet and modern dance. The eclectic mix of music becomes an important character, too. (Ella Fitzgerald, Pyotr Ilyich Tchaikovsky, Louis Armstrong, and Alexander Glazunov are just some of the artists and composers that inspire the dances.) For instance, Charites, a baroque opera trio, provides the voice—a mellifluous and penetrating three-part harmony—of the Queen’s magic mirror, a fantastic choice for a fantastical object. A remixed version of the “Immigrant Song” enhances the guise of the Queen as a Russian seamstress—one of several ruses she uses to kill Snow White. Fun and invigorating, this range of styles showcases the immense talent of Company XIV. At times, the music drowns out some lines, but it’s hard to criticize that: it’s such an essential part of the show. 303 Bond Street looks to have been a garage converted into a performance space, and yet Company XIV has made it into an intimate black box. A translucent curtain provides a cleverly designed set that illuminates the puppetry of the seven dwarves and dance movement. It is easy to be swept away by the dances in Snow White. In one scene, Snow White is wandering in the forest, lost and subjected to heavy snowfall. What follows is an elaborate dance featuring Snow White and three performers dressed in white—personifying the snow—intermingling and pushing Snow White around. It would be enough of a compliment to say that Company XIV’s production feels like a Disney movie being played out on stage, but it’s worth going further with praise: McCormack’s Snow White is a vivid and unique interpretation of a classic fairy tale.